Often my husband makes this soup, and even though we follow the same recipe, I have to admit his always tastes better than mine! 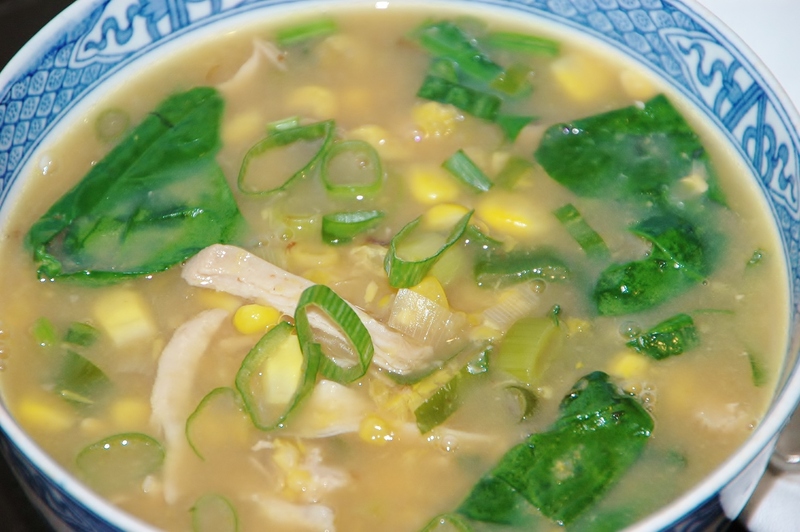 You should have most of the ingredients in this soup on hand at all times, either in your pantry (olive oil, chicken stock, tinned creamed corn and soy sauce) or freezer (frozen corn, ginger). Note: For those of you who don’t already do so, ginger keeps really well in the freezer. While it is still frozen, I use a microplane to grate off what I need as I need it. This saves it from going mouldy or becoming dehydrated and wrinkled in the bottom of your vegetable drawer in the fridge! 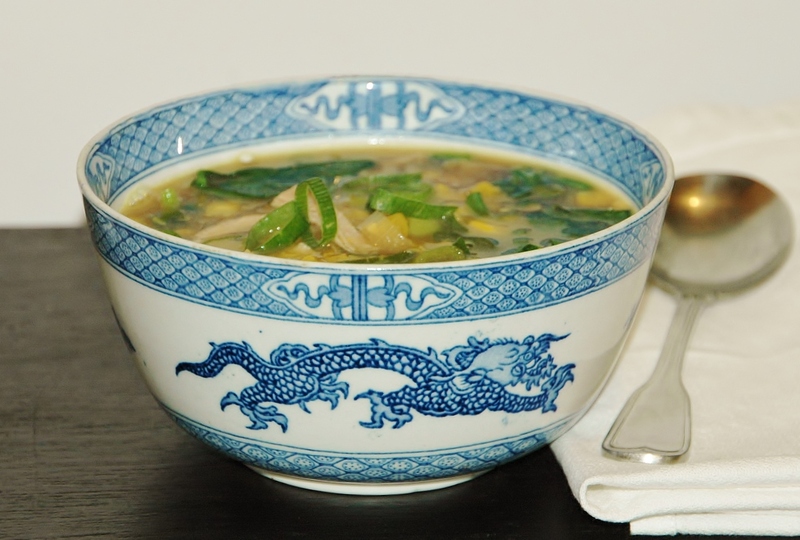 You will then only need to grab chicken thigh fillets, spring onions and baby spinach leaves to make this delicious soup. How easy! 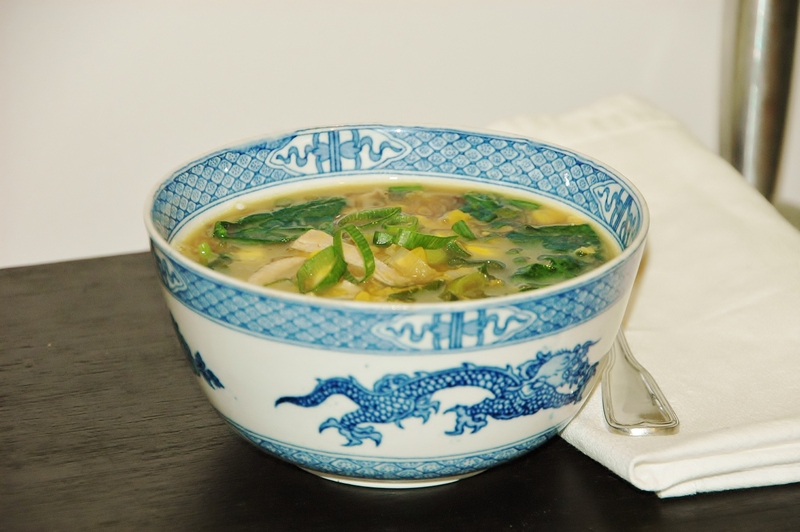 A scrumptious warming lunch or quick dinner (I have been known to add broccoli to it for dinner), if you have any leftovers of this soup it can be frozen. Many of my clients tend to avoid corn as they are scared of the amount of ‘sugar’ it is supposed to have in it! Let me dispel this myth and reveal just why you should be eating corn. Corn is a starchy vegetable (meaning it contains starch, a type of carbohydrate, which is converted into glucose, the type of sugar we have in our blood, when you eat it), however it is low GI (meaning it is digested slowly), so it is a healthy choice. We need to eat foods that turn into glucose (carbohydrate foods) as glucose is the preferred fuel source for your body and the only fuel source for your brain. We need to choose low GI carbohydrate foods to eat as they provide a sustained slow release of energy, can improve your mood and concentration as well as reduce your risk of chronic illnesses such as diabetes, cancer and heart disease. Corn is high in fibre, in particular insoluble fibre which helps to keep your digestive system regular, preventing constipation and reducing your risk of bowel cancer. Fibre also assists in lowering cholesterol levels, preventing heart disease and helps in managing a healthy weight. It is suggested that adults should include 30g of fibre every day and most people fall well short of this. 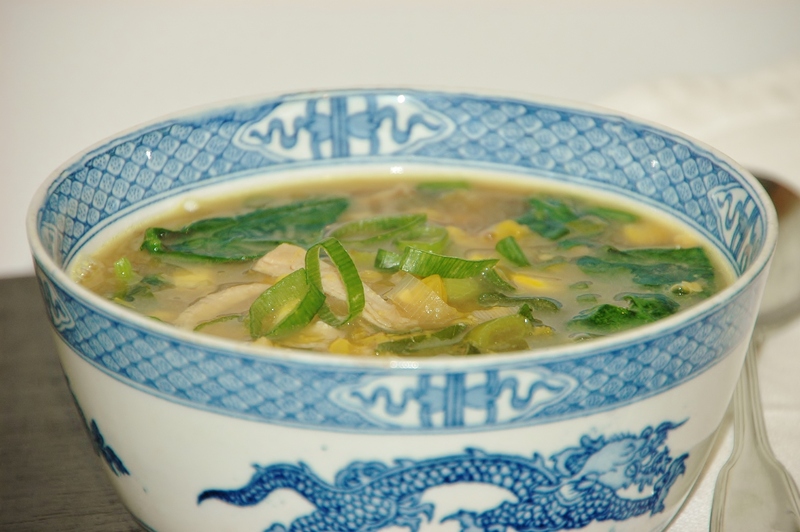 1 cup of corn and a serve of this soup has 4g of fibre which is roughly 1/7th of your daily intake! Corn is actually a unique phytonutrient-rich food that provides us with well-documented antioxidant benefits. Antioxidants tackle harmful free radicals that damage tissues throughout your body. Corn’s phytonutrients include lutein, zeaxanthin and beta-carotene. Lutein and zeaxanthin are two very important anti-oxidants for eye health as they may help protect you from cataracts and age-related macular degeneration. They also provide protection from heart disease and cancer. Beta-carotene is a well known carotenoid or phytonutrient that provides lots of health benefits regarding heart disease, cancer and anti-aging. Your body converts beta-carotene to vitamin A. This vitamin helps keep your immune system working properly, and it is also needed for eye health. As well as the above mentioned, corn is a good source of energy-producing vitamin B1, vitamin B5, and phosphorus, heart-healthy folate, free radical-scavenging vitamin C and manganese. All of this and it also tastes delicious! I made this after being asked by my son to make a chicken soup he can take to school for lunch. I made a larger amount so we had it for dinner and then my son and daugher took it for their school lunch. Another recipe loved by the whole family – thank you! !